So I am considering integrating some video playback within my games. The roVideoPlayer component was labeled as depreciated for a while however the docs no longer say that. Additionally, I believe roVideoPlayer is used for displaying ads, so it's been my suspicion for some time that it wouldn't actually get removed. Clarification would be much appreciated. Re: Is roVideoPlayer Not Depreciated? roVideoPlayer and roVideoPlayerEvent became, uh, un-deprecated i believe. Note these are pure video play, no UI widgets. You should be fine using that in a game together with a roScreen. Indeed, RAF uses roVideoPlayer to display ads in SDK1 apps (incl. games). 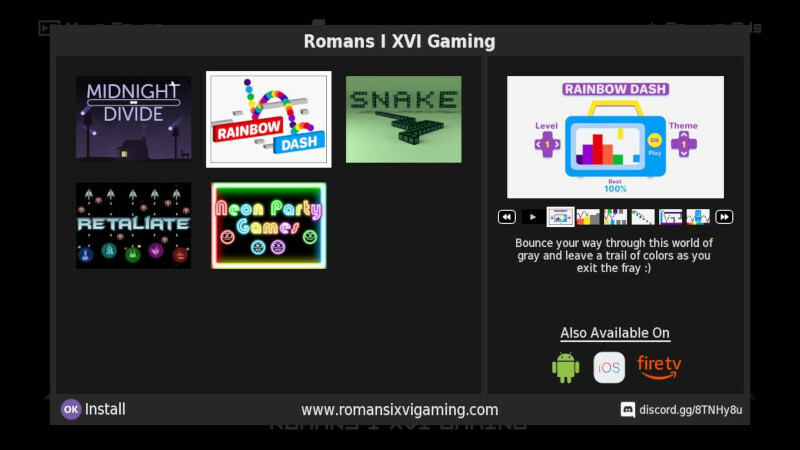 In most RSG apps, a Video node is used for the ads. Perfect, that's great to know, yes I would be using it along with roScreen. Turns out roVideoPlayer is super hard to use with roScreen, especially when you don't want to use the whole screen for the video player. You have to cut out a transparent hole with DrawRect on the roScreen with SetAlphaEnable as false. Also, fun fact, it must be a black transparent hole (&h00000000) to work on all devices, I had it as a white transparent hole (&FFFFFF00) and realized it doesn't work on my Roku TV. This is all really painful to work with, I'm not sure why roVideoPlayer renders before roScreen, it would be nice if it was on top as I assume you would always want videos on top. Fascinating! I'm not ever planning to use this, but I'm curious what you're working on in this regard, as I never thought such a thing was possible. Ah, well it's nothing too interesting, I'm working on a "More Games" overlay that would go in my games to give people a way to easily learn about and install/launch my other games. I have some video trailers that can play in that top right slideshow section there. Last edited by Komag on Sun Mar 03, 2019 1:17 am, edited 1 time in total. I tried that Snake game on a Roku 4 and it just immediately crashes back to the Roku home screen, so you might want to look at that. Thanks destruk, I'll need to look in to that.